May is Mental Health Awareness Month, a time for all of us to join together in an effort to eliminate the stigma that is often attached to this serious issue. It is estimated that approximately 1 in 5 adults in the U.S.—43.8 million or 18.5%—experiences mental illness in a given year. Native Americans, however, are 1.5 times more likely to experience serious psychological distress than any other ethnicity within the general population. From celebrities to someone just like you, there is a worldwide effort happening in social media today to encourage those dealing with mental health issues to get help. This increased awareness is helping to erase the misconception that it’s a weakness to seek counseling and talk to someone. 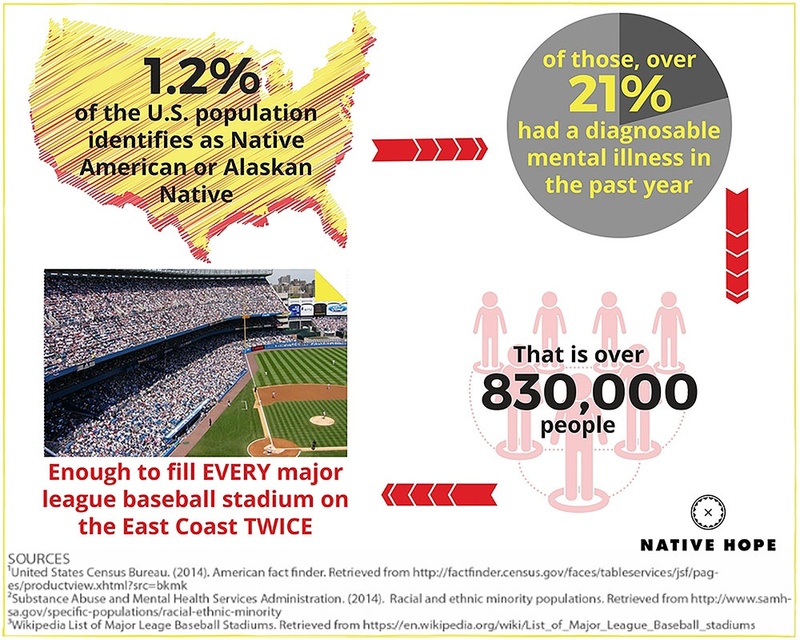 Today, the results of this trauma within the Native American community are a high prevalence of depression, substance abuse, suicide (the second leading cause of death among 10‐34 year olds), and anxiety, including PTSD which is experienced among American Indians more than twice as often as the general population. 2 times more likely to be victimized than any other ethnicity in the U.S.
twice as likely to live in poverty compared to the total U.S. population. falling victim to drug and alcohol abuse at younger ages, and higher rates, than other ethnic groups. looking to suicide as a way out, with some reservations listing their suicide rates at up to 10 times the national average. living often below the poverty level, leaving those dealing with mental health illness unable to afford treatment. However, in the midst of these dire statistics, there is hope. At Native Hope, we are privileged to partner with other nonprofit organizations that offer specialized, professional counseling to all those suffering from the burden of mental health illness, regardless of any financial impediments. The Sacred Heart Center, located on the Cheyenne River Indian Reservation, provides community outreach, child services, and family violence services, including a 24-hour crisis line. Wiconi Wawokiya, Inc. is dedicated to ending human trafficking and providing safety, counseling, healing, and a way out to the victims of domestic violence and other abuse. Their Wicozani Was’te Community Wellness Center provides individualized, long-term support for American Indians on the Crow Creek Reservation. No one should have to suffer in silence. Together, we can erase the stigma associated with mental illness by supporting programs that give a voice to those who are struggling.